Burmac CNG, one of the few licensed CNG Service providers in Trinidad and Tobago, is the premier CNG Service Provider in the country, providing the latest technology in CNG conversions and the best quality equipment, paired with the most professional installations done by trained and certified CNG Technicians. Burmac CNG is your best and safest option. All our installations and parts are covered by best in class warranty, so you can be worry free. No matter what brand or model vehicle you drive, the size of your engine or even what fuel your vehicle uses (gas or diesel), we have the right solution for you. Make up your mind and start saving money! If your vehicle already uses CNG, Burmac CNG is your best option for inspecting and servicing it. No matter if your system came installed from the factory (OEM Installation) or installed locally, our certified and experienced technicians will be able to determine if your installation is up to mark. OEM Installations are to be inspected at the first 1,000 Kms, and after any accident. Locally installed systems are to be inspected and serviced every 20,000 Kms and after any accident. Be safe and sleep better knowing that the best CNG Technicians have taken care of your vehicle! OEM MAXI GRANT - This cash grant of $75,000 for a large Maxi or $45,000 for a small maxi is for those owners who agree to destroy their existing diesel powered vehicle and replace it with a CNG model. The grant goes towards the purchase of an OEM CNG Maxi. MAXI CONVERSION GRANT - This cash grant of $30,000 for a large Maxi or $20,000 for a small Maxi is for those owners who convert their Maxis which are less than 4 years old. The grant will go towards the cost of the conversion. MAXI CONVERSION INCENTIVE -This fuel incentive of $30,000 for a large Maxi or $20,000 for a small Maxi in Free CNG is for those owners who convert their Maxis which are older than 4 years. This fuel incentive will be administered in the form of a fuel card which will be used at the pump to pay for CNG. SCHOOL BUSES (PSTATT MEMBERS) - Members of the Private School Transport Association of Trinidad and Tobago will receive $15,000 in Free CNG on a fuel card if they purchase an OEM CNG Omnibus. Those members who convert their existing CNG Omnibus will receive $7,500 in free CNG on a fuel card. CNG stands for Compressed Natural Gas. It is a gaseous fuel and is a mixture of hydrocarbons, mainly methane in the range of 95%. 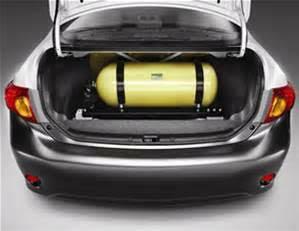 Due to its low density, it is compressed to a pressure of 200 bar to enhance the vehicle on-board storage capacity. Yes, it is safe. The properties of CNG make it a safe fuel. It is lighter than air, and hence in case of leakage it disperses into the atmosphere rapidly. Its high auto-ignition temperature of 540 degrees celsius as against petrol’s 360 degrees celsius makes it even more safe fuel. CNG also has a narrow in flammability range of 5% to 15%, making it much safer than other fuels. In general, the range depends on the size and number of pressure vessels and on the gas consumption of the specific vehicle, as well as on the method of use (urban, non-urban) and type of journey.Converted cars fitted with a 70-litre pressure vessel have the following average range of about 190 – 260 km.